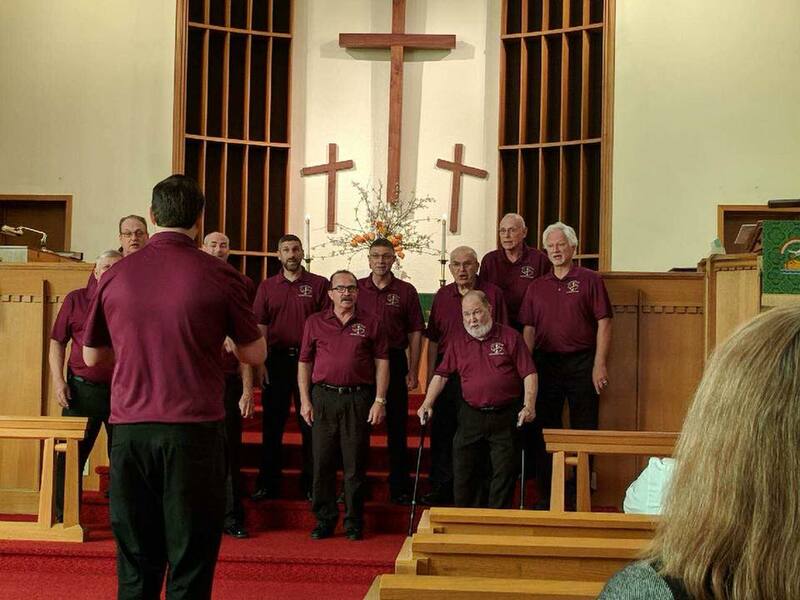 The Rock River Valley Barbershop Chorus (RRVBC) is the Sterling-Rock Falls, Illinois chapter of the Barbershop Harmony Society. For over 60 years, the RRVBC has entertained thousands of people with their barbershop-style singing. front of Grandon Civic Center in downtown Sterling, IL. 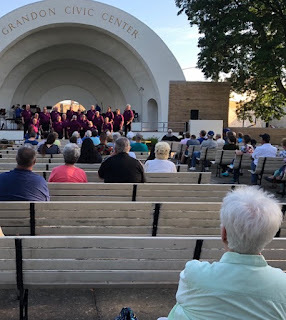 On June 27th we had the pleasure to sing as the pre-concert music for the Sterling Municipal Band at Grandon Civic Center in downtown Sterling, IL. This year the band is celebrating their 90th anniversary and as a part of that celebration they are bringing in musical groups from the surrounding communities to perform their music and share their talents. We are proud to be one of those chosen groups and pleased that we were able to help the band celebrate 90 years of musical tradition! 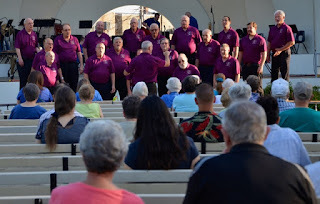 Rock River Valley Barbershop Chorus under the direction of Music Director Tim Pashon. We are helping to celebrate a lot of anniversaries this year! 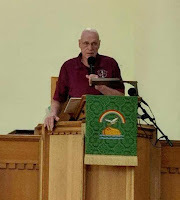 In addition to performing for the Sterling Municipal Band, we were pleased to help the First Congregational-UCC of Lee Center commemorate their 175th Anniversary. What an amazing achievement! UCC of Lee Center 175th Anniversary celebration. This church has such a rich history and it was wonderful to be able to walk around and see the exhibits showing the amazing people and events from the last 175 years. Left: Lost in the Woods, our newest quartet, singing Darkness on the Delta. Occasionally we are able to get some quartets from within our chorus involved in our appearances. This time we had the joy of hearing three quartets add their own talents to the depth of our performance! 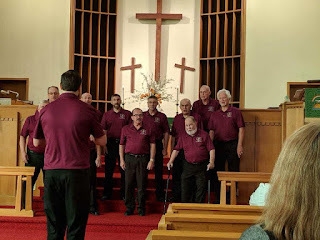 We had never performed there before so we were incredibly surprised and excited to see all the friends of our chorus that are a part of this church! The audience was wonderful and we can't wait to come back and sing for them again! Throughout the summer we will continue to be active through our Sermon-In-Song performances at various churches throughout the area. These sing-outs include a plethora gospel songs as well as a message presented by chorus member Jim Brotheridge that will make you laugh and cry and feel warmth in your soul. We have had so much fun singing for the groups we have already visited and we can't wait to share our message with the people we have yet to meet! We have had such a busy summer so far and we look forward to the performances yet to come! Please check out our calendar for future performances. If you are a man who enjoys singing, come on out to one of our rehearsals in Rock Falls, IL. Check out our Come Join Us page for more details. You can fill out the form or just show up. Whether you come and join us for a rehearsal or see us at a performance, we can't wait to meet you!